Term Life Insurance Rates Scout Launched | Do You Overpay? Unlike auto and home insurance, life insurance is an insurance product that is much more difficult for people to understand. As a result, it is often unclear how much your term life insurance rates will be, how long you are covered under a policy, and the amount of insurance coverage you need. To address this issue, we have just launched a new, easy-to-use tool for Canadians to get a clearer idea of term life insurance rates. Our objective was to create transparency related to life insurance rates. In a few short steps, you will get a clear picture of how much term life insurance will cost. Below is an example of how the tool works. 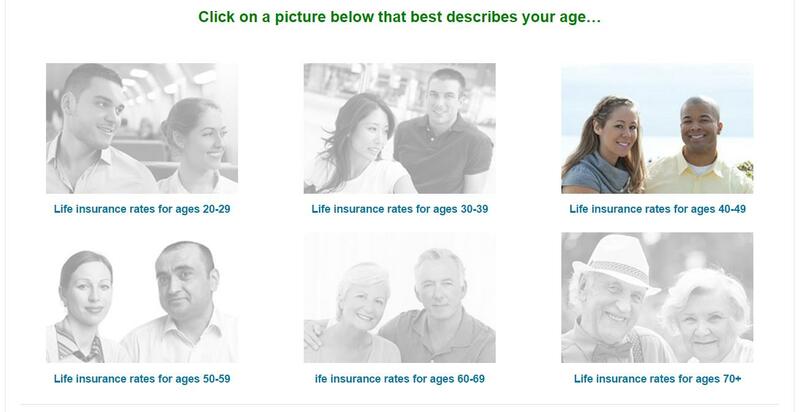 Click here to try our term life insurance tool. The tool consists of two easy steps. First, you will choose your profile by clicking on your age range. 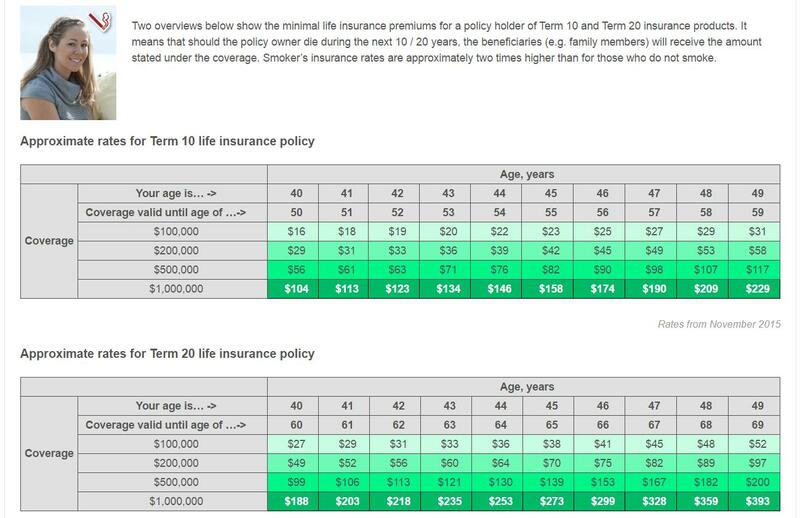 Age is one of the main factors life insurance premium rates are based on – older people pay significantly more in insurance premiums than younger ones (see Exhibit 1). Once you have selected your age range, you will then see several profiles reflecting a combination of gender and smoking habits (see Exhibit 2). Gender: Typically, women pay lower term life insurance rates than men do because their life expectancy is longer. Therefore, the insurance industry sees this particular segment of the population as less risky to insure. Smoking habits: Smoking is neither good for your health, nor for your insurance rates. Insurance companies drastically increase premiums for smokers because they are a higher risk. So, they have to pay almost double the premium rates that non-smokers pay. We have spent considerable time researching how much life insurance the average Canadian has. Based on our review and assessment of our research, we believe that Canadians are grossly underinsured in this area. We believe that this issue exists because life insurance is so difficult to understand. Accordingly, we outlined an overview for you, which highlights the differences among coverage amounts. This way you can see how the process works. Sometimes just a few extra dollars each month can significantly increase the coverage amount for you, and your family. It is important to mention that we only show the basic minimal premiums for each age range; but they can increase depending on your health, family history, alcohol consumption, and other factors. Another informative feature that we built into our life insurance tool is an explanation of the main reasons why each age range needs life insurance. 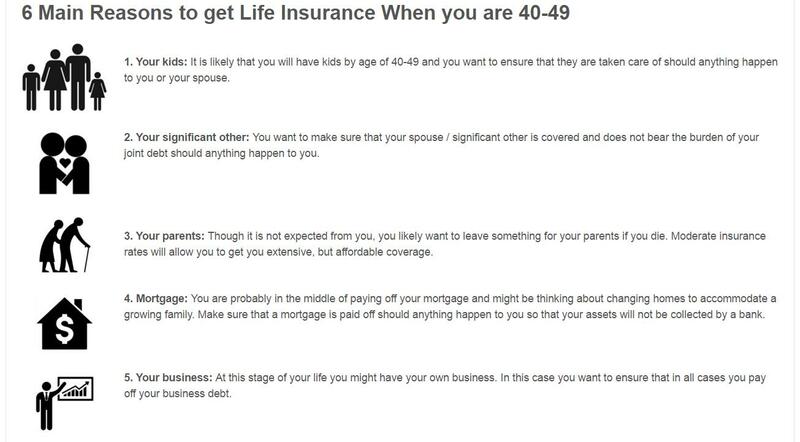 As your life changes, so do your responsibilities and insurance needs (see Exhibit 4). The purpose of life insurance is to bridge the gap between the financial needs of your family and the amount they will get from other income sources and investments when you pass away. The goal is for your family to enjoy the same standard of living as they do now. Some insurance types such as funeral expense insurance plan serve one particular purpose e.g. to cover your last expenses. Thus, the amount of coverage you require depends on the age and financial needs of your dependants; and other factors such as whether your mortgage is paid and how much wealth you have accumulated towards retirement. We hope that you will find this new term life insurance rates tool helpful and easy to use. We would hate for your family to go without life insurance because you don’t understand it. Our goal is to make it easier for you to see your term life insurance options so you and your family can protect yourselves. InsurEye is a Canadian insurance online platform for consumers, where we offer consumer reviews and premium comparisons on different insurance products and companies. We connect Canadians to the best insurance brokers in each province while educating consumers about different types of insurance. Average Home Insurance Cost: Paying Too Much?